New York Ignoring California’s Lessons. Again. MTA outsources $235M Verrazano Bridge project to China – NY Daily News. Bad, bad idea. We tried this on the Bay Bridge in San Francisco, and less than a year later engineers are finding cracks and rust in the welds. NYC could learn a little from us about China’s newest toxic export: tofu construction. This is not a particularly recent article, but one that starts a Californian wondering: what happens to our culture, our land, and our lives when the car is no longer at the heart of all of those things? How does the geography of our cities, and of the entire state change? I know that the first reaction is “hey, it can only be for the better.” Perhaps. But we do need to think this through, and make sure that in our zeal to build a better world, we don’t start tossing babies out with the dirty bath water. There is something profound in the ability to go wherever you want, whenever you want, something that fuels what makes this state unique, prosperous, and vital. We need to find a way to preserve the good of our car culture even as we resolve to expunge the bad. A promotional email from Amazon landed in my in-box. Apparently, the giant bookseller has selected the top 100 Mysteries and Thrillers to read in a lifetime. Mysteries and Thrillers aren’t my genre, so I was surprised to discover that I’d actually read twenty of the books on the list. I shouldn’t have been. California is, one could argue, the birthplace of modern noir mysteries, thanks to Raymond Chandler, Dashiell Hammet, and James M. Cain. Realizing that, I was inspired to come up with a list of the ten California mysteries and thrillers that should be on everyone’s list so as to introduce them to the quintessential pioneers of the genre. If you are a fan of the genrel, let me suggest checking out the California Mysteries page at Cozy Mystery. Danna does a fantastic job of pulling together a comprehensive list of the authors who based their stories in California, many of whom are direct heirs to the legacies handed down by the ten authors above. Amid all of the heartbreaking stories coming out of the senseless tragedy in Isla Vista, all of us here at The Golden West Review want to extend our heartfelt sympathies to the victims, their loved ones, to our friends in and around the UCSB campus. You are all in our thoughts and our prayers. 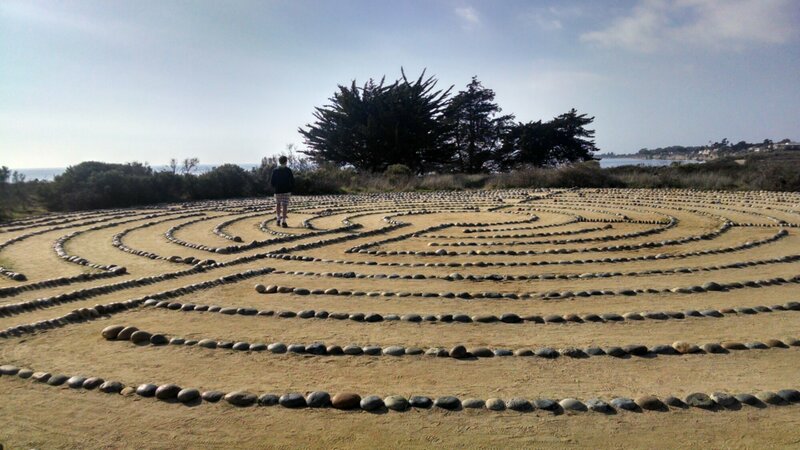 I have posted a photograph of one of the places on the grounds of UCSB that we have always found so healing. Sea, sand, sky, and bluff come together, and walking through this simple circular maze of stone is a physical meditation that seems designed to re-center a shaken soul. May everyone touched by this event find a way to honor those taken from us by turning our horror into something profound and positive. Even as we never forget the departed, may we move forward united in our resolve to spare others from this kind of pain.